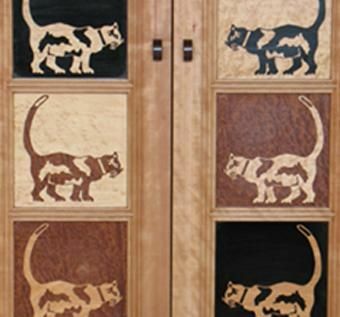 To make the marquetry, eight sheets of differently colored veneer are prepped and stacked, then cut through all at once on the outlines of the cat. 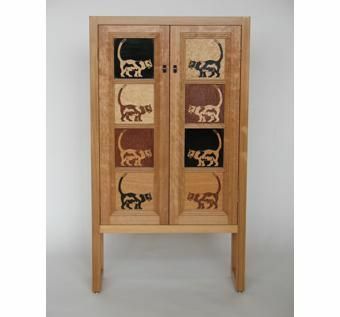 The pieces are reassembled with contrasting colors, producing multiple copies of the same design, though no two panels are the same in color. The process is demanding and complicated. Designed with an Art Deco character, this cabinet is made of cypress and curly cherry with veneers of birdseye maple, black dyed costello, mottled makore, and avodire.